The Cherokee Indians are the largest Native American group in the United States today. This tribe has a unique history, culture and religion that began before europeans arrived. 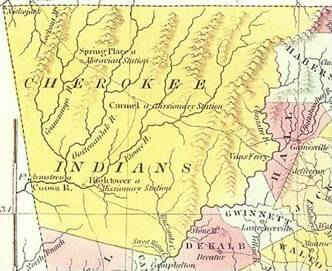 During the American Revolution, the Cherokees sided mainly with the British because they feared that the American colonists would continue to encroach on Cherokee lands. In the 19th century, the Cherokees were known as one of the Five Civilized Tribes because they integrated several aspects of European culture and technology into their daily lives. Although recognizing the Cherokee desire to integrate cultures, the U.S. government removed the tribe from Georgia to Oklahoma on the famous Trail of Tears. Although displaced by the government, members of the Cherokee Tribe fought honorably on both sides during the Civil War, and earned high positions in the military. Since the 1600s, Cherokee history and American history have been intertwined, and they play a vital role in the makeup of American culture. Sandtown is located on the East side of the river just below a Paleoindian crossing at the island of Buzzard's Roost. For thousands of years, deer and bison were ambushed as they crossed the river at what was later called Baker's Ferry, near the confluence of the river and Utoy Creek (outflow was moved in the 1960s). Later Mississippian mound centers arose up and down both sides of the river until 1500s, only to be abandoned in light of the diseases brought by de Soto in 1541. During the Redstick War of 1813-14, Hillabee Creeks from Alabama arrived on the site to escape the ravages of war. They named the place after their village or town in Alabama, Sandtown. This village was located along the disputed boundary of the Creek and Cherokee nations and in 1818, Cherokee improvements upriver were raided and burned by Rolly McIntosh and a band of Creeks. In 1821, the two nations agreed on a boundary at Buzzard's Roost Island, along a line west to Alabama. In 1824, at Indian Springs, William McIntosh, Creek Chief, sold most of the remaining Creek lands in Ga. and was summarily murdered by Menawa and other warriors. Several Cherokee, including Turkey, Peggy Anawakee and Sweet Water came into the disputed area along nearby Sweetwater Creek, leaving their names for Douglas County, Ga. streams into the Chattahoochee. Cherokee style cabins and gold miner's hovels can be found all along the Creek, attesting to the importance of the area during the 1829 gold rush. About 1826, several families from McMinn County, Tennessee arrived at Sandtown for the specific purpose of operating a Pony Club between the Settlers of newly formed Dekalb and Carroll Counties and the Cherokee nation. By 1828, these families were forming the government of Carroll County, stealing from the Indians and venturing into Alabama territory for the specific purpose of stealing horses. Soon Indians could not testify against white men and had no rights whatsoever for redress and they were victimized until they left for Oklahoma in 1838. Sandtown became part of Campbell County in 1828 and remained so until it was merged with Fulton County in 1932. During the Civil War the Cavalry of Gens. McCook and Stoneman operated along the Western front of the Johnson River Line. With the destruction of McCook's command at Newnan, on July 30, 1864 and Stonemans capture at Sunshine Church East of Atlanta, Sherman was forced to employ Gen. Kilpatrick to raid railroads in the absence of Wheeler's Confederate cavalry. On August 15, Kilpatrick put down a pontoon bridge, at Sandtown and crossed the river in force, merging with infantry crossing the Utoy at Sandtown. At this point the entire Federal line had moved from a center at Sandtown to a front with Campbellton, lower downriver at one end and Sandtown at the other. Sandtown remains a small community of Fulton County and the rifle pits and trenches are still visible overlooking the Chattahoochee River.